Back in October, I wrote a post wondering how far back the GOP's relationship with Russia goes and how long Vladimir Putin had been trying to meddle with our political affairs, and closed it with this postscript: "I just ordered this book; I'm curious how far back its stories go. I'll keep you posted." Well, quite far, as it turns out, and it fills in a lot of blanks for me. In Alternative War, former police officer turned investigative journalist James Patrick tackles Russian interference in the UK's Brexit referendum and the US election of President Donald Trump head-on, exposing the reality of the third world war in the face of fake news and sophisticated disinformation campaigns. Based on interviews, documents, and information from both sides of the Atlantic, including an expedition to Sweden to explore Russian-sponsored alt-right disinformatsiya, this book uncovers the truth about the undeclared conflict which has rocked democracy, peace, and stability across the West. Over the course of an extensive investigation spanning Europe, North America, and beyond, Patrick has brought together experts, classified intelligence reports, public records, and witness testimony to build the most extensive and accurate account of Vladimir Putin's assault on the NATO allies to date. The book documents how detached and deniable assets, including Wikileaks and the far-right - including UKIP and Republican officials - were engaged by Russia to successfully subvert two of the world's superpowers and install managed democracies in the execution of a strategy planned over decades, to enhance the Russian position and destabilise its perceived enemies. Patrick's starting point was Russian interference on behalf of far-right parties in Europe, as well as Brexit, and he ended up winding his way into Russia's interference in our election, in which Russia was using techniques they had honed over a number of years in European elections. I'm actually glad that I didn't get around to reading this book until a few months after it was published, because over the course of that time, many of Patrick's claims in a book written nearly a year ago (in a climate where the news cycles are about 20 minutes), have proven true. The best example is that he had pieced together everything that we've found out about Cambridge Analytica's relationships with SCL, the British "Leave movement," and other parties over the last few weeks. This book points out just what a lousy job American media is generally doing in terms of pointing out just how vast a mess the world is in and that the 2016 U.S. Presidential elections are only a piece of a much larger conspiracy that goes back years. They're *starting* to get it (like today's Bloomberg piece about Trump lying about what went on in Moscow in 2013), but they don't see how this all ties together with much of the far-right ascendancy in several countries, including France, Sweden, Poland, Ukraine, and particularly Great Britain (and the list is actually much longer than that). For instance, Patrick asserts that Russia is deliberately trying to cause chaos in Syria in order to create refugees to flee to Europe; the influx of brown-skinned non-Europeans unearths latent racism in European countries (just like with the U.S., Mexico, and a desire to build Trump's stupid wall) by creating an "other" against which white Europeans can unite ad thus embrace far-right parties. After my own significant findings were sent as a statement to international agencies and parliaments in May , the FBI came out at the start of June and declared Nigel Farage a person of interest in their Trump-Russia probe. One source in the Bureau told the Guardian: "If you triangulate Russia, WikiLeaks, Assange and Trump associates the person who comes up the the most hits is Nigel Farage... he's right in the middle of these relationships. He turns up over and over again. There's a lot of attention being paid to him." I'm assuming most of you know who Nigel Farage is, but here's a brief primer from the BBC from 2016. The basics are that he's a demagogic racist, nationalist leader, somewhat in the mold of Donald Trump. For a number of reasons, some related to the nature of a multiparty parliamentary system, others due to events in Farage's own life, he and the nationalist UKIP party that he leads in Great Britain, he has never seized that much power himself, but he and UKIP pushed the more mainstream right-wing Tories to back Brexit and his work probably pushed the Brexit vote just over the edge in 2016. He shows up sometimes on Russia Today, and may have been a conduit between Russia and WikiLeaks. For the purposes of discussion, Farage is a Russian agent. Soon after the Brexit vote, Trump hitched his wagon to Brexit and then something a bit curious happened. As I'm sure I've mentioned before, during the course of the 2016 campaign season, I became obsessed with watching Trump's rallies. I thought that they represented a political phenomenon that was unique and fascinating and then would flame out by the election (obviously not quite) and thought I shouldn't miss history in the making. So I watched pretty much every speech Trump gave from July to November. Curiously, in August, Farage came to introduce Trump at a rally in, of all places, Jackson, Mississippi. Now a book, The Bad Boys of Brexit by Farage associate Arron Banks [JASON'S NOTE: Banks has his own extensive, shady Russian ties, with fog surrounding how he made his money), provides delicious behind-the-scenes details of how a chance meeting between a staffer for Gov. 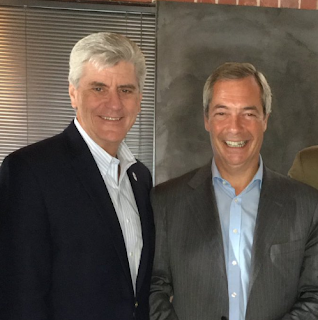 Phil Bryant and Farage at the Republican National Convention laid the groundwork for that unusual political hookup — in Mississippi of all places. On the 12th of April 2017, Arron Banks posted a picture of Andrew Wigmore [an associate of Farage's] in Mississippi. The caption read: "Andy over in the U.S. this week with [Mississippi] Governor [Phil] Bryant & our good friends from Mississippi!" In April 2008, then Mississippi Governor Haley Barbour welcomed a delegation headed by Russian Federation Senator Mikhail Margelov and the US-Russia Business Council (USRBC) President Eugene Larson to Jackson. [...} The Council's mission, it says, is to expand the U.S.- Russian commercial relationship and lobby for an economic environment in which businesses can succeed in a "challenging Russian market." Barbour was the governor of Mississippi between 2004 and 2012, having previously served under Ronald Reagan before becoming head of the Republican National Committee for a number of years. So, not just a governor, a major national figure and also the Chairman of the Republican Governors' Association. At the time the delegation visited Barbour, a Russian investment by SeverCorr was in its first phase in the state and had brought four-hundred-and-fifty high-paying new jobs to Mississippi... Mississippi listed over five billion dollars of exports in 2007 and the state's exportation to Russia alone grew fifty-two percent between 2004 and 2007... Governor Barbour made a public statement that Mississippi looked "forward to a long and thriving relationship with Russia." Margelov had worked as an interpreter in the International Department of the Central Committee of the Community Party of the Soviet Union... He was a spy... In 2009 Canada refused an entry visa for Margelov, by then the Kremlin's special representative to Africa. The reason, according to Canadian sources, was Margelov's connection to the Soviet intelligence services. The Mississippi delegation also enjoyed private discussions with both Governor Barbour and his deputy, Phil Bryant. Parties from the USRBC attended a dinner at Barbour's private residence and Phil Bryant, then the Lieutenant Governor, hosted a private dinner at his home too. But maybe Barbour and Bryant were backwater politicians who had no reason to know better about Russia. Nope. Hayley Barbour, I discovered, had founded a lobbying company called BGR Group in 1991. BGR Group represented Alfa Bank, one of the USRBC members, from at least 2004 until 2015, during the period Barbour was holding the public office of governor... BGR received almost six million dollars from the Moscow bank over the period, for lobbying activity related to "Bilateral US-Russian Relations." The people behind the Russian financial organisation are very closely linked to Vladimir Putin according to the infamous assessment of Christopher Steele, a former British spy. Read Patrick for the details, but Alfa Bank figures heavily into the Trump-Russia story, including in a way that Patrick wasn't aware of yet when he wrote his book last year. This is where things started to come full circle from Mississippi to Russia again. The distinctly shadowy advisor to Donald Trump, Steve Bannon, and equally controversial Trump-appointed Attorney General, Sessions, had already known Farage for several years. In 2012, Bannon invited the UK politician to New York and Washington where he was introduced to Sessions... right in the middle of [the collusion investigation], was a British politician I'd linked to the far-right and Russia already. Visiting the Republican National Committee in mid-2016, Farage met a Bryant aide, John Barley Boykin, who suggested Farage visit Mississippi. The following day a formal invite from Bryant was sent to Farage. On the 23rd of August 2016, Farage arrived in Mississippi with Leave.EU's financial backer Arron Banks. According to reports, it was actually Bryant who asked Farage to speak at the Trump Rally and it was Steve Bannon who telephoned Farage to discuss what he would say. When Farage and Trump subsequently met the next day, Donald Trump was so impressed with the speech he wanted to personally introduce Farage to the stage. Sessions was present at the rally along with another Russia Inquiry figure, former mayor of New York, Rudy Giuliani. Russian oil company Rosneft is a client of Rudy Giuliani's law and consulting firm, Giuliani Partners, and Alfa Bank has previously hired Rudy Giuliani as a paid speaker. Aside from this monstrously deep web of US business links to Russia, along with speeches by British politicians, my investigations had already established more substantial collaborative efforts between the so-called "Bad Boys of Brexit," the Trump campaign, and Russia. Yet, the Leave.EU connection was relevant at the time for one further reason: Roger Stone. During a speech on the 8th of August 2016, Stone said: "I actually have communicated with Assange..." The same day the speech was given, Stone was tweeting about a dinner he had with Nigel Farage, who was, of course, seen visiting Assange in March 2017 and had always refused to give reasons for the meeting. I'm going to stop here because of this bombshell that further backs up: all of Patrick's, and my, assertions. Another shady Brexiteer tied to Russia, and he's also meeting with Phil Bryant. Mueller should be looking in Mississippi. The road from Moscow into the U.S. may go through Jackson via London.